William Morrow Paperbacks, 9780061734564, 352pp. Can lighting really strike twice? Just ask Eve, whose husband walks out on her in the middle of a garage sale. Eve's beloved Ivan died thirteen years ago in an automobile accident. Her charming, boyish Chuck has taken a different exit out of her life: hopping into his car in the middle of a garage sale with no forewarning and departing their formerly happy upstate New York home for points unknown. Now Eve's a boat adrift, subsisting on a heartbreak diet of rue, disappointment, and woe-left alone to care for Ivan's brilliant teenaged son, Marcus, and Chuck's precocious, pragmatic nine-year-old daughter, Noni, while contending with Charlotte, Eve's acerbic mother, who's come north to "help" but hinders instead. But life ultimately must go on, with its highs and lows, its traumas and holidays, and well-meaning, if eccentric, friends. A house and a heart in disrepair are painful burdens for a passionate woman who's still in her prime. And while learning to cope with the large and small tragedies that each passing day brings, Eve might end up discovering that she's gained much more than she's lost. 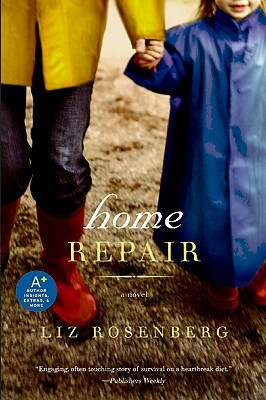 A poignant, lovely, funny, and ultimately uplifting story of love, family, and survival, Liz Rosenberg's Home Repair is an unforgettable introduction to a lyrical, wise, and wonderfully vibrant new literary voice. Why do you think this book is called Home Repair? Who and what is broken in this novel, and how does it get repaired? Eve initially responds to her situation by going on "The Heartbreak Diet" and dressing out of her hamper. Does this ring true to you? How have you, or the people or other literary characters you've known, reacted to heartbreak? They say that a tragedy ends with a death, and a comedy ends with a marriage. Since Home Repair has some of each, do you think this is more of a tragic or a comic novel? In some ways, Home Repair is about change. What are some of the notable changes in this novel? There are many minor characters all through the novel: Mia; Jonah; Clem; Devin; Maxine Schwartz etc. How do you feel they strengthen or distract from the novel? The last chapter of the book has a surprise element. What did you think was going to happen? What did you want to happen? What is the role of family in Home Repair? What is the role of friendship? Marcus goes through some tough experiences in this novel. Are they believable, and do you think teenagers really have to face challenges like this? What is the role of Rec Park in this book? Does it represent anything beyond itself? There is a big, messy Thanksgiving dinner in the middle of this book. Why do you think the author chose Thanksgiving for this scene? What is the meaning of this scene for the rest of the book? Marcus challenges the Senator to a debate. Should young people be more or less involved in politics? How can they be involved effectively? Who would you say is the most heroic character in this novel, and why? Charlotte says to her daughter, "We're all going to someday say goodbye, little girl. We're all going to have to cry." Do you believe this is true? If you had to say one thing to someone about loss, what would it be? In the chapter called "On the Diet" Eve realizes "she simply didn't have any time or space to weep in. She'd have to give it up and move on" In what other ways is she constrained? What are some of the ways people make space for themselves in this novel? How does the idea of an open space come to play in the book? What is the meaning and purpose of Van Gogh in this book? Olivia says that "Art can save lives…. Van Gogh's failures teach us never to give up hope." What do you think the role of art should be?